Being a huge social media star with 1.6 million Instagram followers has its downsides. Just ask Australian fashion blogger Nicole Warne, aka Gary Pepper Girl. 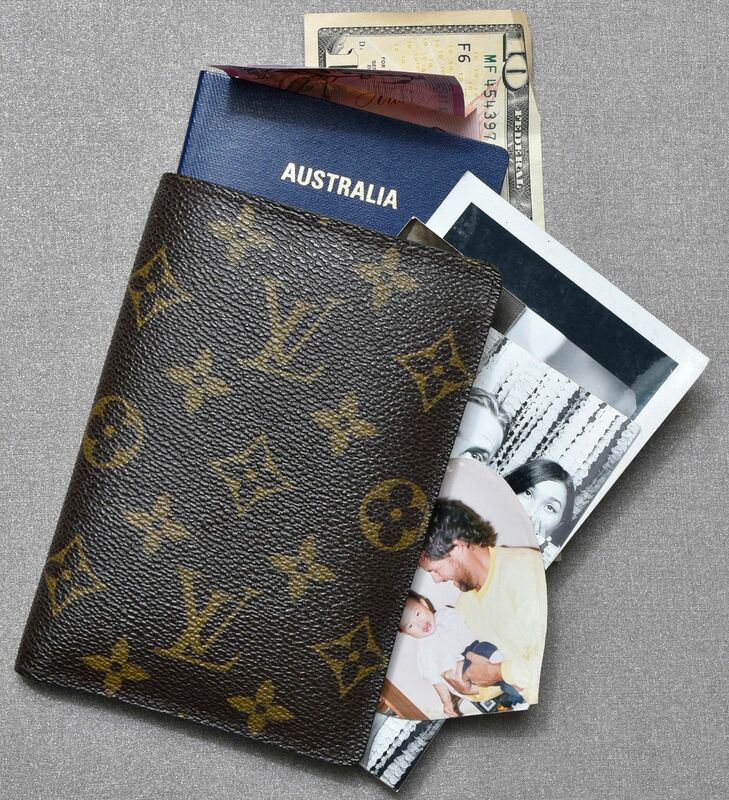 The 27-year-old Sydney native, who flies around the world for work and to attend international fashion weeks, has had to cut down on her travel because of pain in her back, which had "gotten quite bad at the end of 2015". As flights to New York or Paris take at least 25 hours from Sydney, she will be relocating to New York with her fiance, photographer Luke Shadbolt, 31, to cut down travelling time. Warne's eyesight has been deteriorating, as she is constantly updating her social media accounts with videos and images on her iPhone. She found out three weeks ago when she did an eye test, after realising that she "couldn't read my Uber number plates anymore". She counts French fashion brands such as Chanel and Louis Vuitton, and luxury online retailer Net-a-Porter as clients. I bought this at the Chanel flagship store in Hong Kong two years ago. I love that it is unique– I had not seen a Chanel bag with such fabrication before. It’s woven metallic tweed, so it’s very delicate. It’s a modern take on a very classic style by Chanel. I got this at the Apple store. It’s very good. 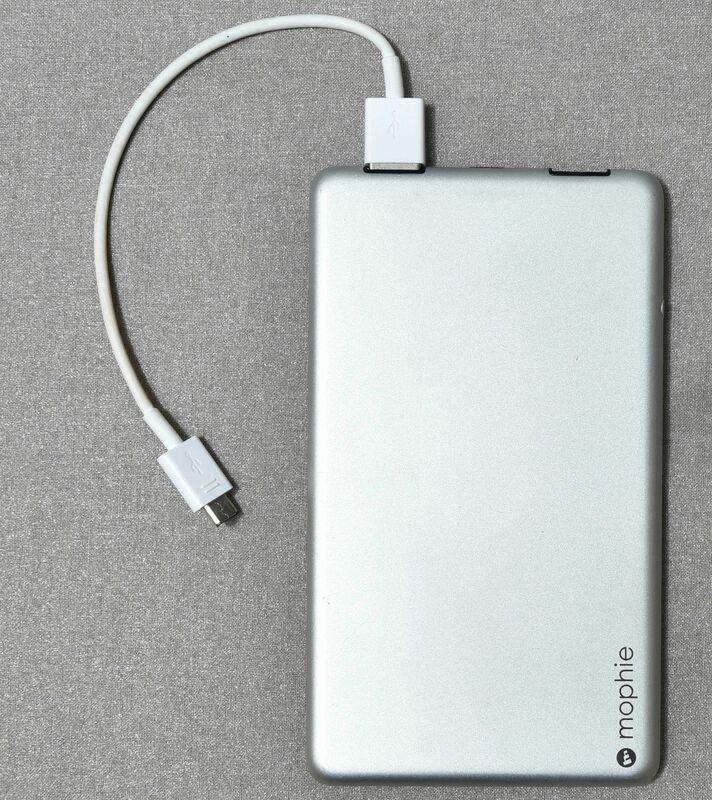 I need at least two recharges a day for my iPhone 6 Plus. I’m constantly travelling and I edit all my Instagram photos on my mobile device... editing and Snapchat use up a lot of power. 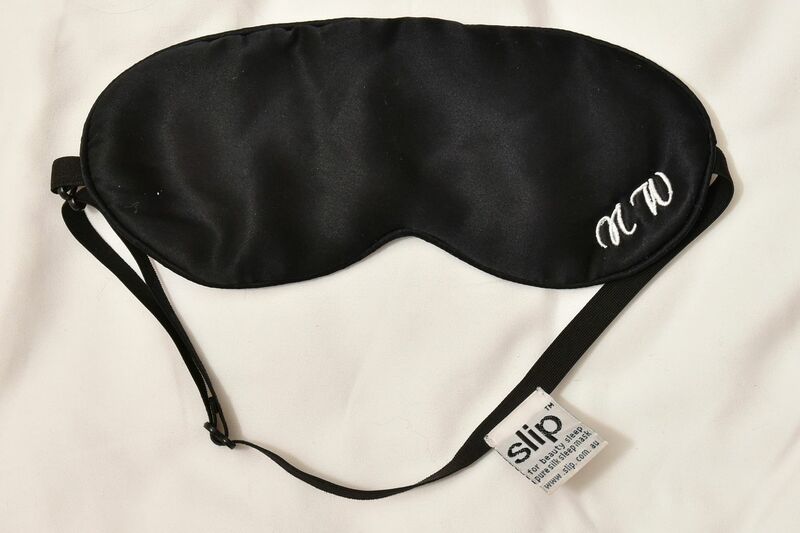 I’m very strict about my skincare regime and this satin eye mask does less damage to the skin and pores compared to a cotton one. The satin is gentle and does not irritate the skin. I sleep a lot on the plane or while waiting for my flights, so this comes in handy. 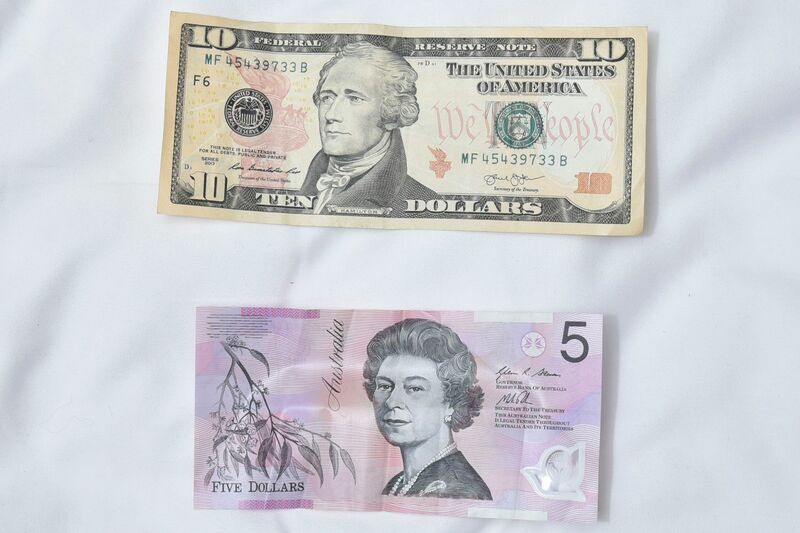 I split my time between Sydney and New York, so I always have some American dollars in my purse when I have to tip in cash. Some taxi drivers don’t accept credit cards. I carry photos of my family with me, especially when I travel so much. The black and white photo strip is of my fiance. 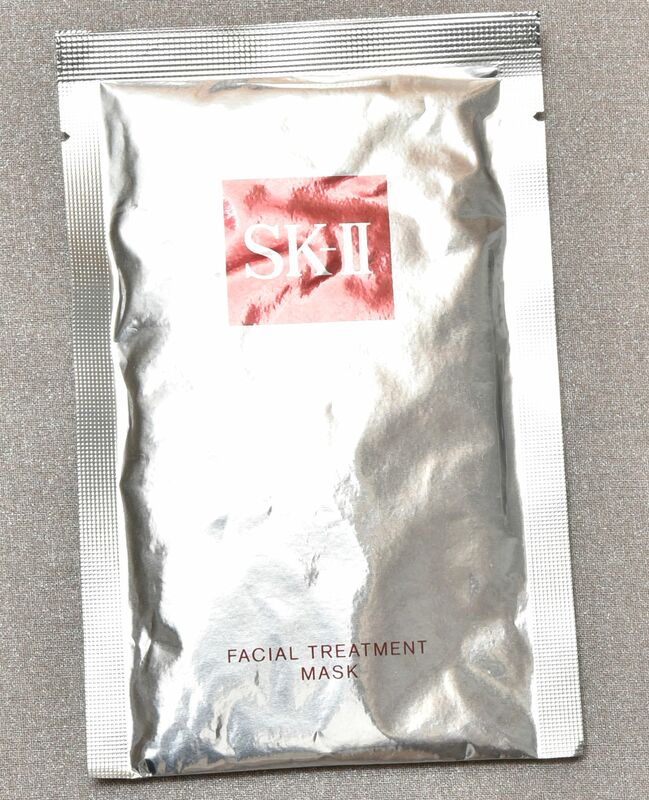 I always put on this mask after a flight. Every cover shoot is memorable. Harper’s Bazaar is a milestone because I interned there in Australia, so being on the cover is like coming full circle. Warne, who is of Japanese and South Korean descent and was adopted when she was three months old, was in town last week and had a packed itinerary. 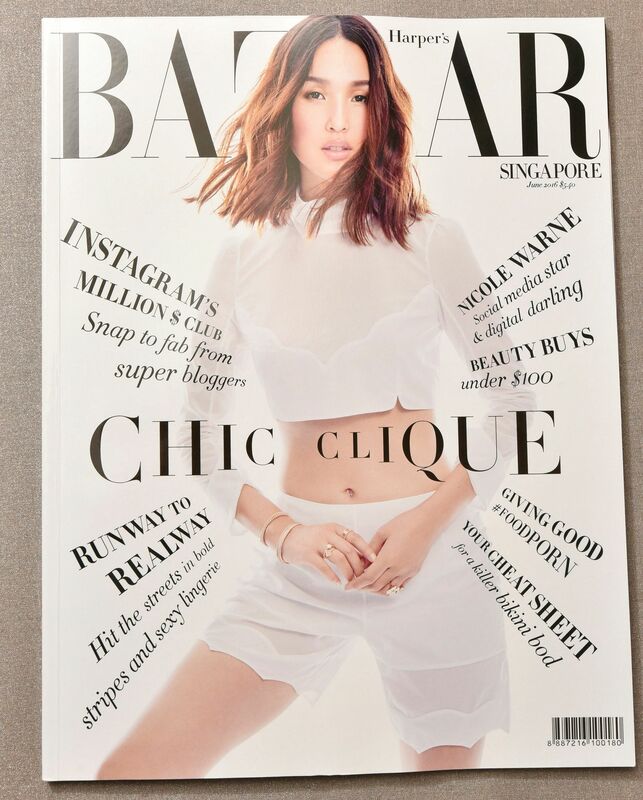 The June cover girl for Harper's Bazaar Singapore and Malaysia lent her support to the magazine's NewGen Fashion Exhibition event at footwear retailer Pedder on Scotts in Scotts Square, where she met fans and industry peers. She also attended the inaugural Forbes 30 Under 30 Asia summit at The South Beach hotel, having been named on the list in the arts category. Her visit also coincided with the episode premiere of Asia's Next Top Model, in which she was a guest judge. Says Warne of her experience on the reality modelling show's fourth season: "I was worried about coming across the wrong way. I wanted to be honest, but I don't believe in being too negative." She expresses similar sentiments when asked if there was anything she would change about social media, saying she would "change the negativity" and make it "more regulated and controlled". "I think social media allows everyone to have a voice, but I don't think it educates people on the differences between constructive criticism and malicious comments." Warne says she got her risk- taking streak from her entrepreneurial parents. Her father had an online science store while her mother had a dog-washing business and biscuit company. "They are very experimental and they were not scared to take risks. I think that kind of filtered into my work ethic." Warne started Gary Pepper Vintage in 2009 when she was 19, selling vintage clothing on e-commerce platform eBay. A Facebook page she started the same year gained 60,000 fans in two months. She quit her full-time job as a fashion boutique retail manager and her internships at fashion magazines Grazia and Harper's Bazaar to focus on her business. But the success of the store did not take Warne by surprise. She had mapped out the brand's business direction six months before its launch, which included having "a warm and authentic tone of voice and a strong marketing plan". She has since rebranded Gary Pepper Vintage to Gary Pepper Girl, and employs a manager, assistant and business developer. She reveals her intention to increase the number of followers on Instagram and brand revenue, but declines to reveal figures. Although the extent of her influence only hit her when she surpassed one million followers on Instagram in October 2014, she is a focused woman with an innate understanding of social media. "I have always had a very clear goal and understanding of my audiences and what they love, which have definitely been a strong asset in growing my business."